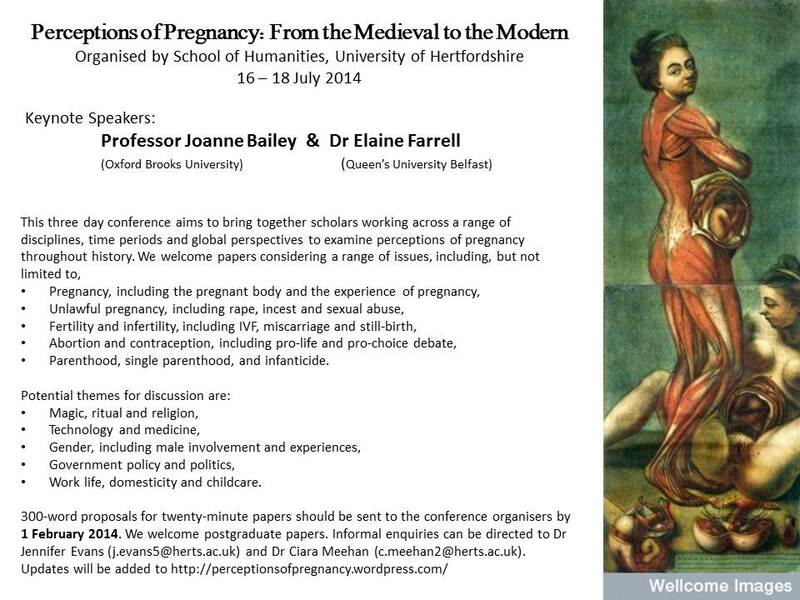 Perceptions of Pregnancy: From the Medieval to the Modern is a three-day conference that I am co-organising with my colleague, Dr Jennifer Evans. It will be held at the University of Hertfordshire between 16 and 18 July. The response to our call for papers so far has been fantastic, and with abstracts coming from places like Finland, Poland and America, we are on target to hold an international discussion on perceptions of pregnancy throughout history. Our confirmed key-note speakers are Professor Joanne Bailey of Oxford Brookes University and Dr Elaine Farrell of Queen’s University Belfast. The deadline for receipt of proposals is this coming Saturday, 1 February 2014. See the call for papers below, or visit our blog where we’ve also been posting columns that address some of the conference themes. After July, our aim is to continue the conversation via the blog. Yes, it’s certainly shaping up that way. We’re very excited about the conference.